Velar brings unparalleled luxury to the Range Rover line. 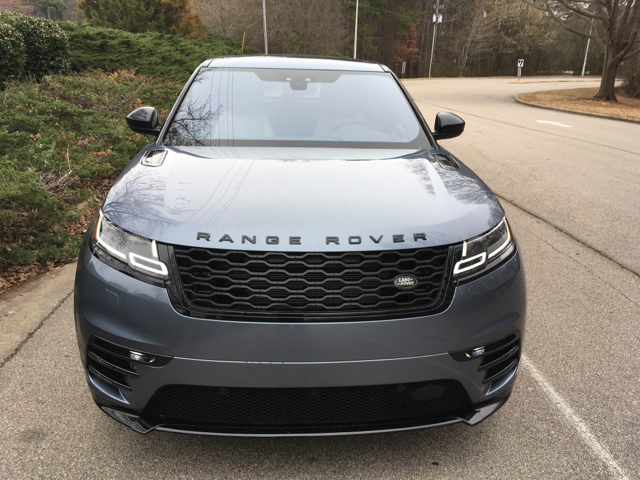 2018 Land Rover Range Rover Velar in R-Dynamic trim. Land Rover continues to make a name for itself, seemingly more so these days with its Range Rover line versus its Discovery range. That’s due mostly to an all-new Range Rover Velar model that simply rewrites the definition of what a luxury SUV is all about. The 2018 Land Rover Range Rover Velar burst onto the scene last summer, a model built on the same platform underpinning the all-new Jaguar F-Pace SUV. Yes, Jaguar and LandRover are one, but for this model, Jaguar took the lead and Land Rover followed. The duo shares a similar suspension, the same engines and an identical platform architecture, but the sheet metal is unique to each. The 2018 Range Rover Velar is available in six grades: Velar ($49,900), Velar S ($54,700), Velar SE ($67,400), R-Dynamic SE ($60,100), R-Dynamic HSE ($67,600) and Velar First Edition ($89,300). Add $995 for the destination charge. 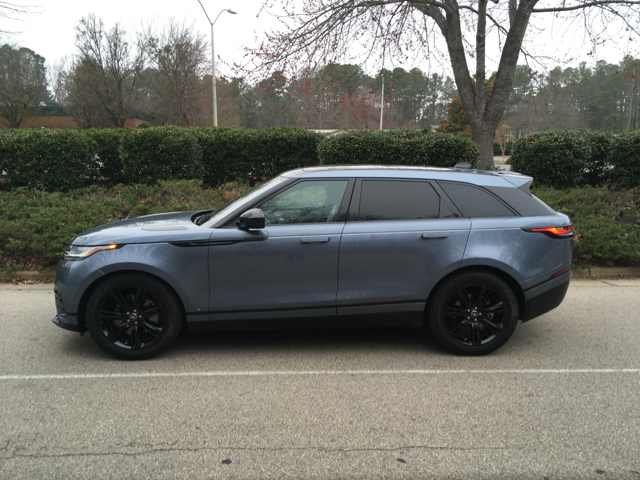 My test model was a 2018 Land Rover Range Rover Velar R-Dynamic HSE with a base price of $77,100. That’s because it had one of six metallic paint choices (in this case, Byron Blue) adding $610 to the price. Two standard colors are included and then there are three additional metallic paints that cost $1,525 each. Also adding to the price is an R-Dynamic Black Package ($635, with Narvik Black paint treatment on the hood vent blade, grille mesh and surround, fender blades and exhaust finishers), perforated Windsor leather seats ($4,575, with light oyster and ebony trim), light oyster suede cloth headlining ($920), a 1,600-watt Meridian sound system ($3,060) and a head-up display ($970). When using Land Rover’s online price configurator to build a sample model, I wasn’t able to match the base price on the Monroney, so I figured some items were simply included in the price. Beyond what I already mentioned, my test Velar had an active locking rear differential ($1,125), satellite and HD Radio ($615), four-zone climate control ($870), an Interior Premium Textile Package ($715) and an On/Off Road Package ($580, with terrain response control and configurable dynamics), and other features. The final price was $86,190, but it could just as easily have retailed for thousands more. 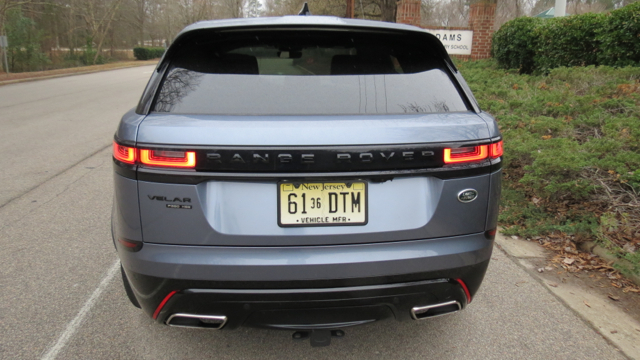 Indeed, the Velar First Edition model with diamond turned finish wheels ($3,775) and Oxford Road Paint ($8,580) puts this model in six-figure territory. 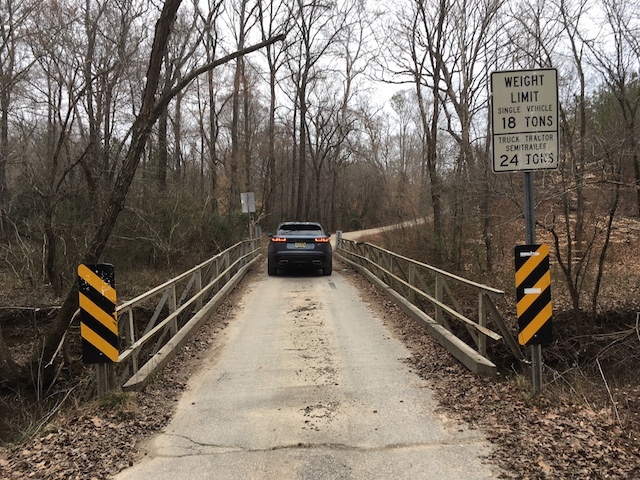 Fortunately, you can find a well-equipped Velar for under $75,000. As for the model at hand, the Velar is one of the most stunning vehicles ever to sport the Range Rover name. 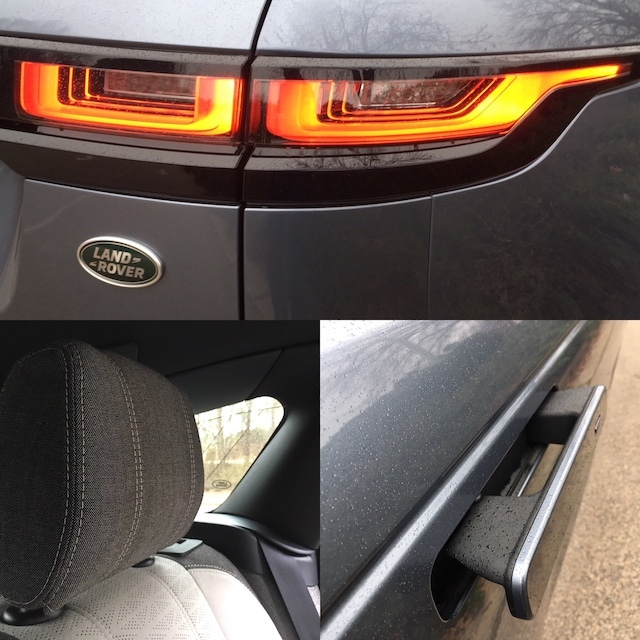 Certainly, the Evoque has the more flamboyant body style, but the Velar earns its own design plaudits, largely by retaining the brand’s captivating appearance, while opting for more rounded edges. It represents a design distinction that marries traditional Range Rover looks with a thoroughly modern appearance — and it works. In the Velar, handles remain flush with the door until needed, emerging fully from the canvas and staying erect until the driver pulls away. Very little chrome is apparent, with the upscale look resting on its curved canvas. Standard features include automatic headlights, front and rear LED lights, rear fog lights, 18-inch 15-spoke wheels, a sliding panoramic roof, a power liftgate and a spoiler. There are numerous upgrades available, including wheel sizes and design choices, a heated windshield, roof rails, blacked-out touches and power-folding side mirrors with approach lights. Inside, the cabin “brings it” to the segment by taking the opposite approach: it is first-rate as well as first class. 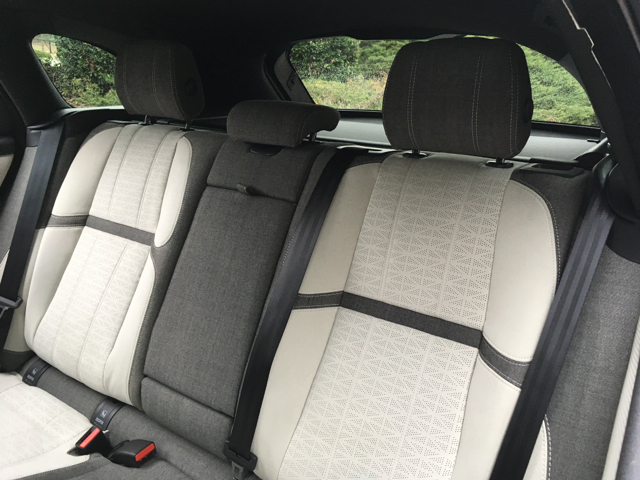 Leather liberally covers most surfaces, including the upper and lower dashboard, the seats and the steering wheel. Suede covers nearly everything else — running up the roof pillars and covering the ceiling itself. But it just may be the available advanced materials that set this vehicle apart. 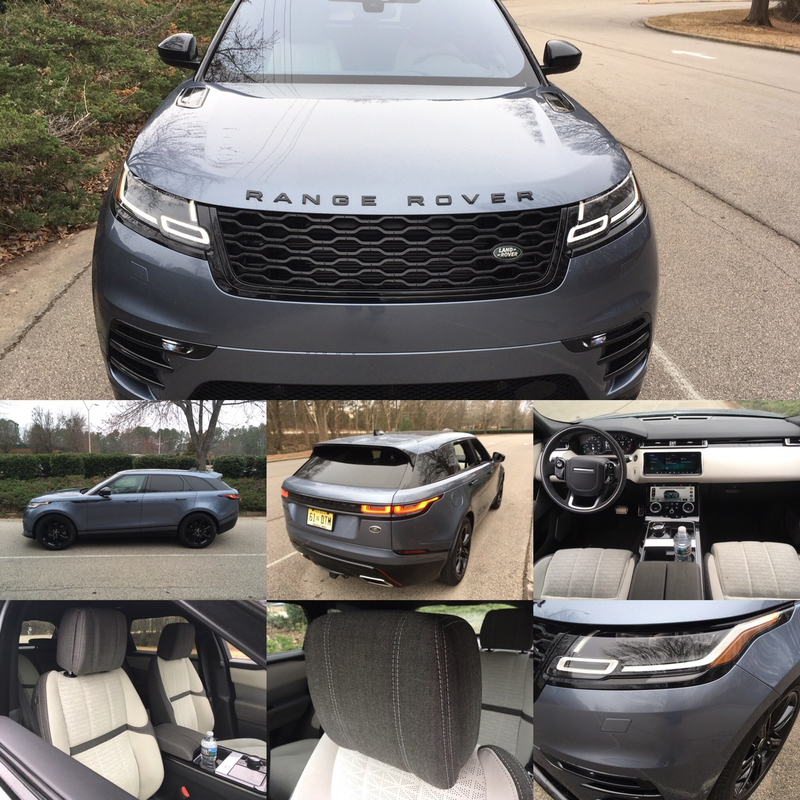 Indeed, my weekly driver included the perforated Windsor leather and added what Land Rover calls “Premium Textile” to the lower dashboard, door inlays, center console and other surfaces. The look is stunning, the feel is unusual, but entirely appropriate. Add in aluminum and other metallic touches, and the interior stuns and amazes. 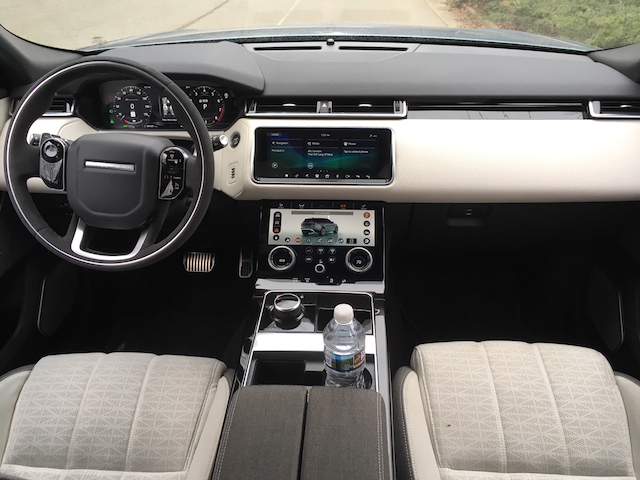 One of my favorite features was the dual 10-inch center console screen known officially as the Land Rover InControl infotainment system — Touch Pro Duo. With the ignition on, the top screen lights up and then tilts forward. The bottom screen, depending on the setting chosen, features an outline of the Velar or the seats, supplying touchscreen control of many key systems. Gone are switches and knobs, replaced by touch control. That said, the system requires a fair amount of time to learn. You might discover surprising features such as massage function, uncovered by my son as he played with the controls while I concentrated on my drive. The Velar is a five-seater with an optional two-seat third row or jump seat. Our test model didn’t include the extra row, but that was fine with me as this SUV offers 70.1 cubic feet of standard cargo space. Yes, the Velar is beyond roomy in terms of storage — it easily swallows up a week’s worth of luggage for five. There are no penalty seats in the Velar’s cabin, which means that five may sit in comfort. Of course, the best seats in the house are up front, where wonderful support, heated and ventilated seats, and a massaging function awaits. The driver has a commanding view of the road and the front passenger is bedazzled by the beautiful touch points throughout. Standard features include keyless entry with push-button start, a tilt-and-telescopic steering column, 10-way power front seats and zoned climate control. Available features include rear seat remote release levers, a heated steering wheel, 20-way seats, a lockable cooled glove box, cargo space divider rails and configurable ambient lighting. The standard eight-speaker audio system is found only in the base model. All other Velars have one of several available Meridian packages with 11, 17 and even 23 speakers available. As you might imagine sound quality only gets better as you choose among the systems. That said, you may find the 11-speaker Meridian audio system delivers what you want — it is that special. Other tech features include Land Rover’s proprietary connectivity system, satellite radio, HD Radio, USB ports and navigation. Driver assistance features include standard cruise control with speed limiter and lane departure warning. 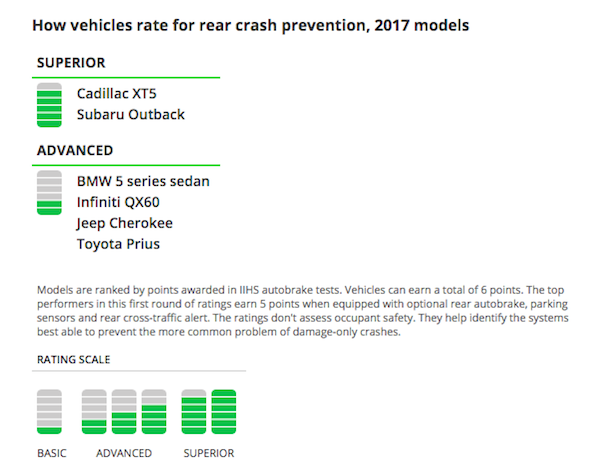 Available tech includes adaptive cruise control, traffic sign recognition, blind spot monitor, lane keep assist, reverse traffic detection, parking sonars and a parking aid. You expect performance under the hood of every Range Rover and in the 2018 Velar, you won’t be disappointed. That said, you’ll find a pair of 2.0-liter turbo engines for your consideration — one for gasoline, the other for diesel. 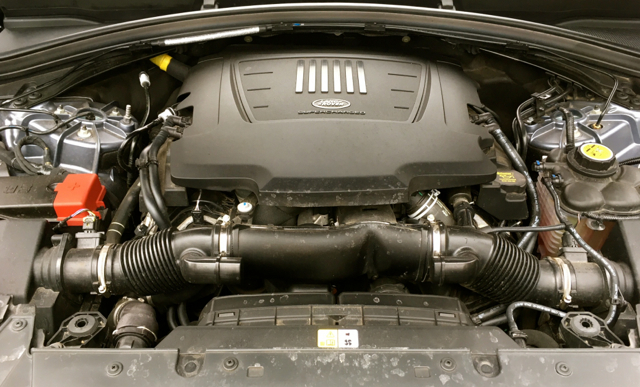 These two Ingenium engines power several Jaguar models and, like the available supercharged V6, they’re paired with an eight-speed automatic transmission. I can’t comment on the workings of the smaller engines in the Velar as the supercharged V6 powered my test model. This engine makes 380 horsepower and 332 pound-feet of torque, delivering generous off-the-mark acceleration and passing power. What helps matters is the adjustable suspension — set it low when traveling on the highway for improved handling or set it high when taking this beauty off-road. The Velar’s electric-powered steering doesn’t supply the connected feel you find in similar Jaguar models, but then this is an SUV, not a sports sedan or an F-Type. The ride is comfortable, although be careful with your wheel choices — the sweet spot here may be the 20-inch wheels. There is a feeling I get every time I review a Land Rover product and that is a sense of inadequacy. No, not because of knowing that I’m out of my league as far as buying one, rather as far as describing one. You see, just as you think you’re taking a deep dive with this product, you realize that there are numerous fabric options, tech choices and seating options not mentioned. Even describing every sensory experience is sometimes hard to convey, such as the feel of the textile on door inlays, the look of the center console, even the smell of the cabin. Land Rover works diligently to design and build every one of its models and looks for different ways to surprise, even delight shoppers. Not having tested the Velar with the smaller engines, I cannot offer my opinion on either. What I can say is the V6 is wholly suited for this model. 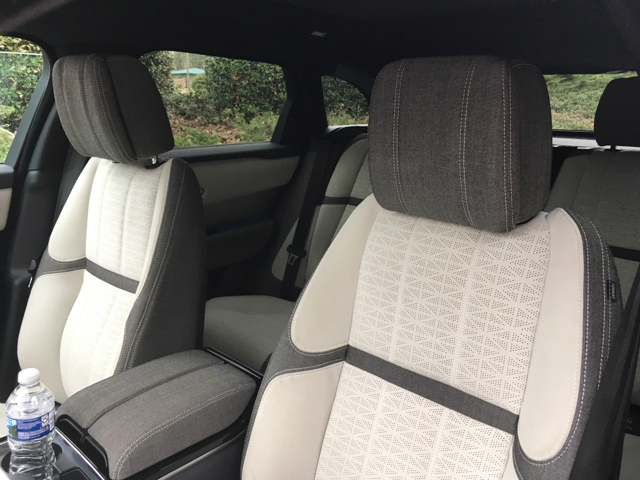 As for choosing your trim, moving away from the base trim substitutes real leather for imitation leather and opens up a world of upgrade possibilities that is certain to please the most ardent Range Rover aficionados. Range Rover Velar Competitive Set: Audi Q5, Porsche Macan, Jaguar F-Pace, Alfa Romeo Stelvio, BMW X5 and the Mercedes-Benz GLC Class. Range Rover Velar photos copyright Auto Trends Magazine. All rights reserved.